Thompson Center for Dentistry offers one of the most convenient and state-of-the-art techniques for patients who are missing all of their teeth: it’s called All-on-4®. This treatment can not only provide a more stable and secure option for dentures, it can also give patients a convenient alternative to other missing teeth replacement procedures. Plus, All-on-4® is known as the “Teeth in a Day” technique, allowing patients to achieve comprehensive teeth replacement in just a single day here at our office. All-on-4® involves the placement of a total of four dental implants on the upper or lower dental arch. A custom-designed denture will then be permanently placed atop the implants, which can provide individuals with a more stable, implant-supported denture that yields full teeth replacement in that area of the jaw. The results should both look and feel more like natural teeth, and should not move or slip along the gums. The All-on-4® procedure can often benefit patients who may not be candidates for missing teeth replacement procedures that utilize full sets of dental implants. The All-on-4® technique also offers another significant benefit: for many patients, the procedure can be performed in just one day. Our dentist will perform a comprehensive oral evaluation during your initial consultation and determine whether All-on-4® is an ideal treatment for your needs. After Dr. Uyen Thompson has examined your oral structures and you have both decided that All-on-4® is ideal for your goals, a customized treatment plan will be created. The treatment plan will be based on the results of advanced x-ray imagery, a digital impression, and other components that will help determine the precise location of the implants in order to yield the best possible fit and function for the denture appliance. During the All-on-4® procedure, the dental implants will be carefully inserted through the gum and anchored to the jawbone. A temporary denture can then be affixed to the implants, allowing this “Teeth in a Day” procedure to truly live up to its name. In the ensuing months, the implants should fuse to the bone, essentially becoming artificial tooth roots. Once this process has run its course, the permanent custom-designed denture can be placed, and the procedure is complete. For some individuals, the All-on-6 variation of this procedure may be necessary to provide the best possible outcome. 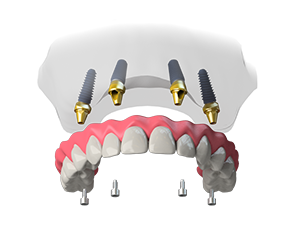 The All-on-6 technique utilizes the same basic approach as All-on-4®; however, it adds two more implants per arch to provide the foundation for the custom denture. All-on-6 is typically recommended for patients who may need a bit of extra support due to lack of sufficient bone quality or other concerns. Dr. Thompson can determine whether All-on-4® or All-on-6 is the better procedure for your needs during the initial consultation. All missing teeth on the upper dental arch can be replaced. This can significantly improve speaking and chewing, as well as restore the appearance of one’s smile. Replacement of all missing teeth on the lower dental arch can also be very beneficial for chewing and speaking. In addition, lower arch replacement can help to prevent changes in jaw symmetry and facial appearance that can be caused by a full set of missing teeth in this area. For patients who are missing all of their teeth on both the upper and lower dental arches, the All-on-4® or All-on-6 implant denture technique can be performed to produce a comprehensive full mouth restoration. Learn more about full mouth restoration. The total price of All-on-4® implant dentures is not always the same for each patient. Since the procedure is customized to each individual’s needs and goals, the cost of All-on-4® will be dependent on your personalized treatment plan. The cost of your procedure will include factors unique to your treatment plan, such as the total number of implants that are being placed, the overall complexity of the procedure, fees for laboratory work and materials, the price of the custom denture appliance, and other components. Dr. Thompson and our entire team firmly believe that quality dental care should be available to all, regardless of their individual financial situation. This is why we accept numerous payment methods in order to make treatments like All-on-4® as financially viable as possible. A member of our team will create a total cost estimate at your initial consultation and go over it with you. This estimate will include all fees associated with the procedure so that you will have a full picture of what to expect before you have the treatment. We will be happy to answer your questions and talk with you about payment options that can suit your budget. For more information on All-on-4® Teeth in a Day, or to schedule a consultation, please contact Thompson Center for Dentistry today!